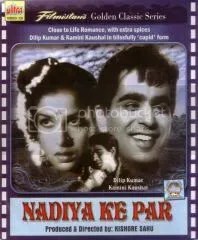 Nadiya Ke Paar (Hindi: नदिया के पार) is a 1949 (or is it 1948?) Hindi film produced by Filmistan Studios and directed by Kishore Sahu (remember him? he played Dev Anand’s father in the 1972 film Hare Rama Hare Krishna). The film starred Dilip Kumar, Kamini Kaushal, S L Puri, Maya Bannerjee, David, Tiwari and Ranibala. Music was directed by C Ramchandra (who preferred the name Chitalkar when he sang). The film must not be confused with Rajshri Production’s 1982 film of the same name, starring Sachin and Sadhna Singh. Both films, however, had one thing in common. They both had a strong Bhojpuri storyline, rustic Bhojpuri dialogues and great songs. Storyline of course has the usual rural ground as was found in films of those era, but the language has a touch of Chhatisgarhi and not Bhojpuri.Kishor Sahu belonged to Rajnandgaon in Chhattisgarh and his affinity to the land inspired him to produce a film that could represent it. Its worth noting that Bhojpuri and Chhattisgarhi have similarities for both being related to Eastern Hindi. Its a great language. Just love it.